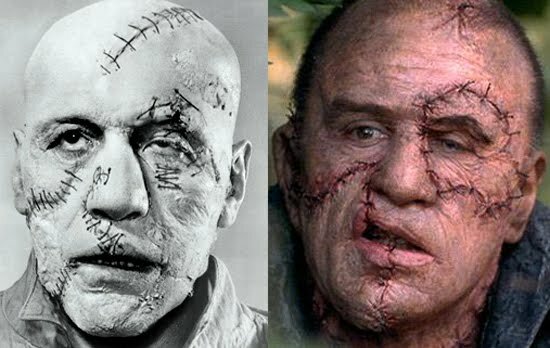 Several comments posted here, on Facebook and points between have noted how Primo Carnera’s Frankenstein makeup from 1957, revealed here last week, was very similar to that worn by Robert De Niro in Mary Shelley’s Frankenstein of 1994. True enough. Bald and stitched cranium, sutured cheeks, upper lip and chin, and a damaged left eye. Very similar indeed, but Primo and Bobby were neither the first nor last of their monstrous kind. Lon Chaney’s Monster for TV’s Tales of Tomorrow in 1952 heralded Carnera’s version with a baldhead and face-splitting stitch work. Springing 60 years ahead, the effect was revisited and worn by Jonny Lee Miller and Benedict Cumberbatch, sharing the part, in the celebrated British National Theater version of 2011. Call it same-school monster makeup. Somewhat related, without facial distress, chrome-dome Monsters are known to sport ‘round the head, dotted line stitching indicating radical brain surgery. The two finest examples are — going from the ridiculous to the sublime — Cal Bolder in Jesse James Meets Frankenstein’s Daughter (1966) and Freddie Jones’s heart wrenching Creature in Frankenstein Must Be Destroyed (1969). These Frankenstein Monsters are of a family. When opting for a baldhead look, similarities are perhaps inevitable. There are only so many ways to stitch a baseball. Tales of Tomorrow: Frankenstein’s Notorious TV Adventure. I'd say the Carnera/De Niro similarities are more than coincidental. Diagonal right-left stitch across pate, arched stitch across eye, right eye to right ear stitch diagonal stitch across left cheek, left nostril to mid-lip stitch, lip to chin stitch, open left eye, weak/semi-shut right eye. I'm guessing the latter was more than inspired by the former. Ugh, the less I'm reminded of Branagh's wretched version the better. Despite the very obvious similarities between Carnera and De Niro's make-up designs, I'm guessing that it's just one of those amazing coincidences. If the Carnera make-up design was "lost" since 1957 it's unlikely that the De Niro make-up was based on it. There are only so many places (that make sense) to put stitches so, sooner or later, similar designs were/are inevitable. Of course, it's also possible that the make-up team somehow saw a photo of the 1957 Canera design and thought, "Hey, this version is lost! Let's bring it back!" Were all the stills from the Canera version lost or just not well publicized? I believe Rick Baker did the De Niro makeup and he's quite knowledhable about such things (were there any photos in one of Don Glut's books?). The crazy-quilt stitches might fit an artist's design sensibility... but unless Victor had real hand coordination issues, most random ones don't make a lick of sense surgicially! Anon: Baker had nothing to do with the Branagh Frankenstein (Baker won the oscar for ED WOOD that year). The only photo of Carnera’s Monster in circulation for all these years was a small and very blurry thumbnail. The photos revealed here were found thanks to the relentless research of collector and film historian George Chastain. Of course, the film people might have had a copy of these UPI photos but, still, I believe we are looking at coincidental resemblances. I remember extensive coverage of the film in Fangoria and how the makeup people said they were going for a patchwork look. The Carnera face has random stitching, the De Niro version is meant to show whole chunks stitched together: The right cheek, right chin and half the mouth are one piece “dropped in” (note pale skin). The left eye and cheekbone is another chunk popped in, note the circular scar around it. Arms and legs were also of different mismatched sizes and color. Craig: The Karloff/Pierce Monster with its flat, fliptop lid made no sense either. Brain transplants, as once unfortunately performed on monkeys, were done through the back of the head, the whole thing inserted drawer-like, with access to the spinal chord. Mary’s Monster, of course, bore no resemblance whatsoever to any of these. Shelley describes tight skin exposing muscles and arteries beneath, and compares The Monster to a mummy, with its thin, parchment skin. The words “stitch” and “scar” do not appear in the book. MARY SHELLEY'S FRANKENSTEIN was nominated for the Best Makeup Oscar(Daniel Parker, Paul Engelen and Carol Hemming)as well. Suddenly realizing that Benedict Cumberbatch is the same brilliant actor who's currently playing the BBC SHERLOCK made me wonder who else has performed that unlikely pair of characters over the years. Christopher Lee, of course (Sherlock AND Mycroft!) -- but who else? 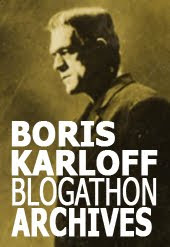 A stretch, but Boris Karloff *might* qualify for his retired beekeeper sleuth "Mr. Mycroft" in "Sting of Death" on TV's ELGIN HOUR in 1955, based on Gerald Heard's Holmes pastiche A TASTE FOR HONEY. A close-but-no-cigar candidate: Raymond Massey, whose monstrous, stitched-together Jonathan Brewster persona is based on a movie performance by Boris Karloff. Anybody else who did it more legitimately? Peter Cushing played Frankenstein and both Sherlock and Mycroft. His Frankenstein was more of a monster than most of his creations. If you really think about it, the Frankenstein Monster lost his hair over the course of his legacy. In the original novel he had long hair. In the '31 film, his hair got shorter. In that film's sequel, it was even shorter thanks to his burns. 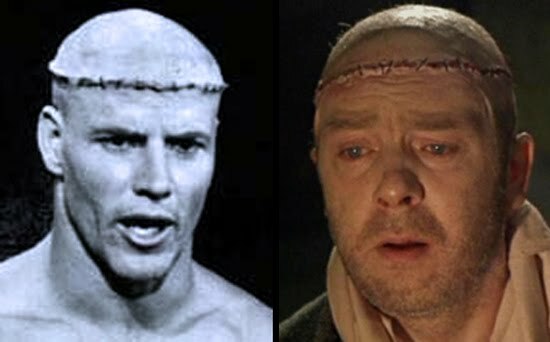 In "Young Frankenstein" he was balding on top. Now he's usually always completely bald. Cushing and Rathbone were Frankensteins and Sherlocks. And John Cleese was Dr. Waldman. This line of connections is interesting and valid too, but I was talking about actors who've played both Frankenstein's MONSTER and Sherlock. I should've been more specific. Cushing *might* still qualify -- isn't there at least one place in the Hammer series in which the doctor himself is brought back to life by his own lab techniques... in REVENGE, perhaps? Absolutely understood, George. I was expanding on the idea and noting Sherlock actors in Frankenstein films. And by the way, lots of Sherlocks involved in DRACULA, too! Yes, Cushing is rebuilt, so to speak, in REVENGE. He's also defrosted in FRANKENSTEIN CREATED WOMAN. @Egorschamber I did realize you were asking which actors played both the monster and Sherlock. I mentioned Cushing because his long run as Dr. Frankenstein is unique. In Frankenstein Created Woman he's revived after being frozen for an hour. The only other film in the series that I've seen is Curse, the first one, so I don't know if there's one in which he's actually brought back from the dead. Didn't mean to be snarky, and hope I didn't seem so. I agree absolutely that Hammer's (and Peter Cushing's) Dr. Frankenstein was usually much more monstrous than his lab creations. I webfooted around a little bit hoping to find instances of old time radio actors or cartoon voice artists who spoke for both the Monster and Sherlock, even fleetingly. No luck so far but I'd bet the farm that at least one or two of those specialists did. Re the Monster's hair. The 2004 Luke Goss version is pretty close to Shelley, long hair and all. The 1995 children's show WISHBONE had an short adpatation of the book. 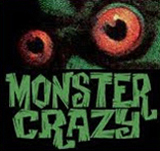 The Monster starts out bald but grows long hair as the story progresses. There's also a long haired Monster in Frankenstein vs. The Creature from Blood Cove. More long hair: Charles Ogle (see above post)TORTICOLA CONTRE FRANKENKSBERG (1952)and a number of 70s creations like Bo Svenson and Michael Sarrazin.